June 2017 – GRAITEC, an international BIM, Fabrication and Design software developer for AEC, and Autodesk® Platinum Partner in US and across Europe, is delighted to announce the release 2018 of Advance BIM Designers. Advance BIM Designers is a BIM solution improving structural projects management. It helps users to create, design, document, track and control structural members of a BIM project, especially in the Autodesk Revit® environment. This version 2018 of the Advance BIM Designers is a real milestone bringing new features and more rebar functionalities, offering new innovative packages and streamlining the BIM workflow. In this version, the Advance BIM Designers are grouped under 2 series: Concrete Series and Steel Series. Joseph PAIS, GRAITEC Product Director comments: "With those packages modification, we are taking into account the feedback of our customers and adapting our proposal to better fit their needs !" 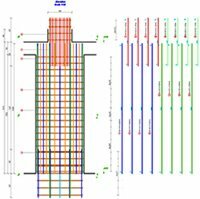 This "Rebar Detailing" package is an innovative solution for the draughtsman using REVIT to produce rebar drawings. It will allow the draughtsman to quickly generate parametric 3D rebar cages, automate rebar views creation, produce automatically the technical documentation (annotations, drawings, schedules) and provide effective tools to fine tune rebars and drawings. With the "Rebar Design & Detailing package", engineers access to the next level of functionalities and can design rebar cages according to Eurocodes and North American codes within Revit® or as a standalone application, and produce automatically design detailed reports with all the requested references to the design code check. The BIM workflow is improved in the 2018 release with this new "group of elements" functionality allowing to design and produce the 3D rebar cages on a group in one click! The Synch-Import-Export on multiple elements selections is now available, as the schedule of improvements (preview of schedule by type, update watermarks). The Rebar drawings have also been improved. Automatic Bending details in drawing views. Advance BIM Designers - Steel Series - Connection: With two new connections clip angle and gusset. Joseph PAIS, GRAITEC Product Director comments: "In this release 2018, we focused on improving our tools with new functionalities requested by our users and on improving the BIM Structural workflows. The BIM Designers are really the tools for high skills levels professionals who want to increase their productivity and manage their BIM projects in the most effective way!"